This lib is about network requests with blackjack, roulette and craps! Using it you will be able to convert your massive API layer code into an awesome convenient controllers with easy and maintainable network requests! How to send several requests? You’re able to run up to 10 requests one-by-one! Or you can run unlimited amount of requests one-by-one or at the same time, if you need just a completion handler. CodyFire is available through CocoaPods. I promise that this is API code architecture from your dreams which are come true! Easily use your API endpoints! //then somewhere send creation request! let videoData = FileManager.default.contents(atPath: "/path/to/video.mp4")! How to put Authorization Bearer token into every request? For that we have a global headers wrapper, which is called for every request. You need to declare it e.g. somewhere in AppDelegate. How to set a global unauthorized handler? How to set desired status code and what’s that means? Usually servers response with 200 OK and CodyFire expect to receive 200 OK to call onSuccess handler by default. You may need to specify another code, e.g. 201 CREATED for some POST requests. How to set some headers for a request? How to switch environments through Xcode’s run schemes? It’s really useful feature and I suggest to use it in every iOS project! 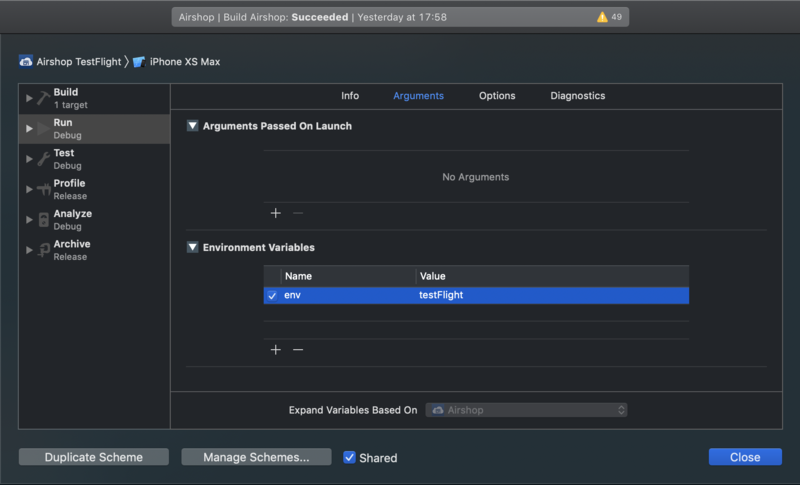 Then in every scheme in Arguments tab add Environment variable named env with one of those values: dev, testFlight, appStore. All done, now you’re able to easily switch environments! How to execute request without onSuccess clojure? What does custom error means? You may define your own custom errors, globally or for each request. onError block contains NetworkError object with StatusCode enum, an error description, and a raw response Data. Error description you could change to whatever you want for any error code. By default there are already defined some good descriptions for common errors. How to set response timeout? How you’re detecting current environment? Run up to 10 requests one-by-one! onRequestStarted, onNetworkUnavailable, onCancellation, onNotAuthorized, onTimeout also available! Hope this lib will be really useful in your projects! Tell you friends about it! Please press STAR ⭐️ button!! !